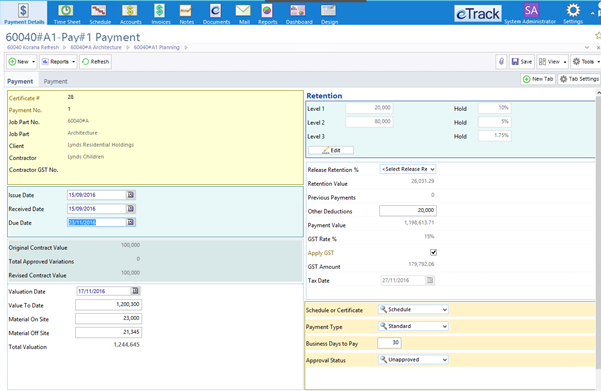 Integrated throughout eTrack are features to support Contract Administration. If security allows, staff can search and create RFIs, certificates, instructions, progress reports, progress claims, defects, adjustments of time, adjustments of contract fees and keep track of contract details and insurances. Construction Stages and Milestones are defined from templates and edited graphically in the Scheduler. Create contracts, certificates and any other document you design with one click and store them as Documents in eTrack and/or as files in your existing file structure. Then email the documents and save them in a transmittal. 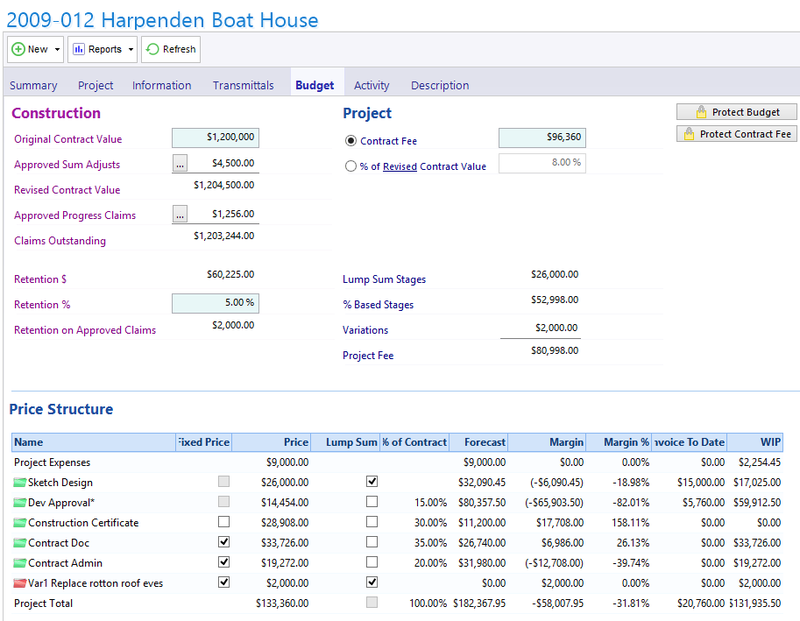 View the Construction Budget and Project Budget on one screen. Manage Retention with multi-level amounts and percentages. Track Sub-consultant Claims and Payments. Fully configurable registers and fields. Use eTrack’s document templates with inserted fields or create your own. Graphically schedule your construction milestones. Email documents, file and view transmittals. Search and view transmittals by project, client, document, date, consultant etc. 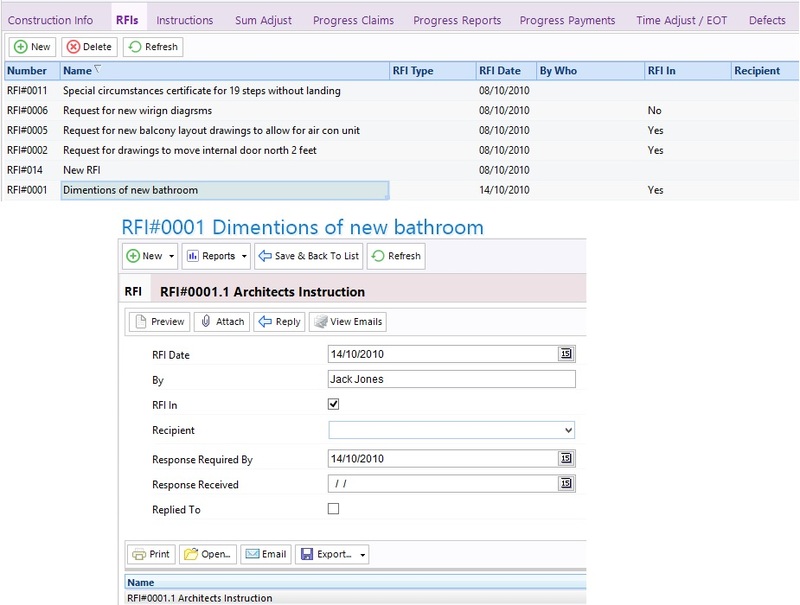 When you select the Construction part of the Project, eTrack displays a ‘Register’ for each of the following allowing simple fast access to everything to do with Contract Administration. Adjustments of Time (that automatically updates the Practical Completion Date Milestone). Contract Sum Adjustments (that automatically updates the Contract Fee). Each Register can be sorted, filtered, printed, exported and the details viewed by simply double clicking, using the same common user interface as the rest of eTrack. Different Constructions can be defined as templates and Construction Stages created for each. You can have more than one ‘Construction’ for a project. Typically these are represented as Milestones that depend on each other and can be viewed in the Schedule. By viewing the Construction Stages and Architect CA Phase, together, you’ll graphically be able to adjust resources on the CA Phase to reflect changes in the Construction schedule. The Construction budget is kept separate from the Architects budget but the key performance indicators of both can be viewed on one screen. 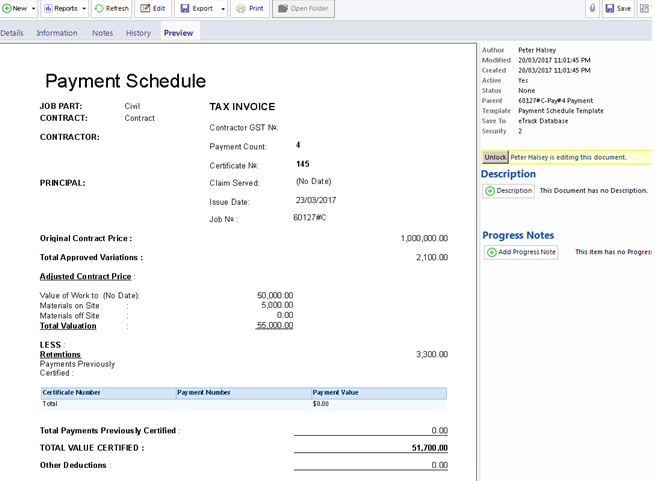 Here is an example of a Payment Register. Each Payment is tracked as follows that allows for three Retention levels and percentages to be defined. Previewing a payment will open a tailored document and populate it with fields from eTrack. Careful management of all documents and drawings. Automatic filing of documents in directories on your server or FTP site. Recording of all documents sent and received in a transmittal register. Emailing one or more documents to one or more recipients from within eTrack and automatically recording each recipient/document pair in the transmittal register. Please see the Features Menu for more. eTrack brings the power and flexibility of a complete system to manage Contract Administration, integrated with your practice management system.